I’ve always been a big fan of pumpkin pie probably because of the flavor and consistency, but also because it makes for a great breakfast the morning(s) after Thanksgiving. 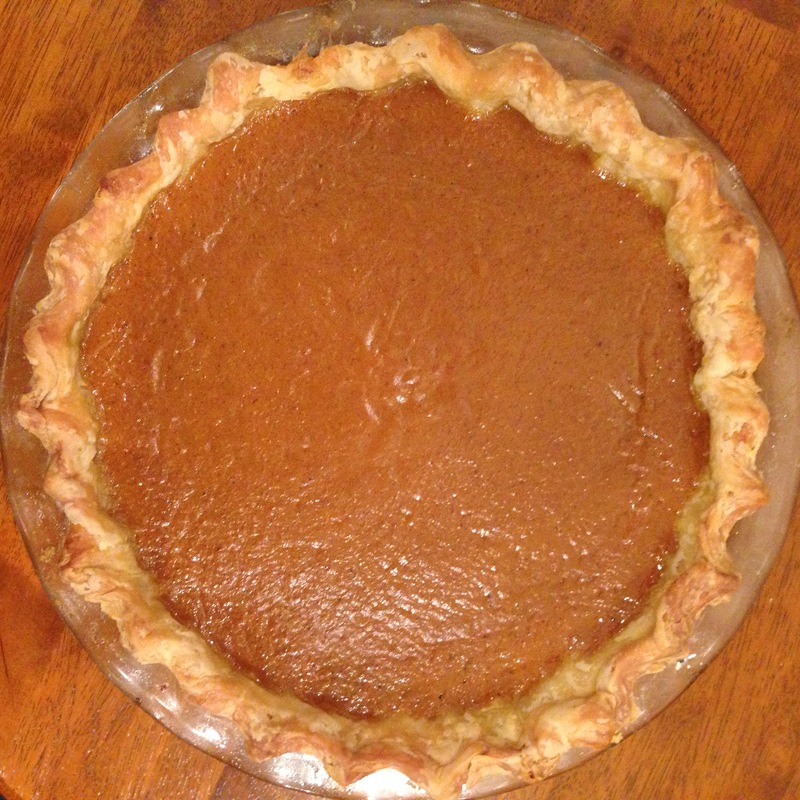 Similar to my quest with the pecan pie this year, I wanted to try a recipe that was not a derivative of the most typical pumpkin pie recipes found on the back of the canned pumpkin label. So, I turned to America’s Test Kitchen again. Based on recipes found here. I used this pie plate, which easily held all of the filling. Make the pie crust. Preheat oven to 400 degrees. Line crust with foil and fill with pie weights. Bake on rimmed baking sheet for 15 minutes. Remove foil and weights, rotate pie plate, and bake 5-10 minutes more until crust is golden brown. While pie crust is baking, whisk cream, milk, eggs, yolks, and vanilla together in a bowl. Combine pumpkin purée, yams, sugar, maple syrup, ginger, cinnamon, nutmeg, salt and pepper in a large, heavy-bottomed saucepan, bringing mixture to a “sputtering simmer” over medium heat (5-7 minutes). Continue to simmer the pumpkin mixture, stirring continuously and mashing yams, until thick and shiny (10-15 minutes). Remove pan from heat. Whisk cream mixture into pumpkin mixture slowly, until incorporated, then strain into a medium bowl. Whisk mixture again, then transfer to pre-baked pie shell. Return pie with baking sheet to oven and bake for 10 minutes. Reduce heat to 300 degrees, then continue baking until edges are set (20-35 minutes). Transfer pie to wire rack and cool to room temperature.